Next of our applications for Ethereum Pools. This app is for checking workers on Dwarfpool Mining Pool (Dwarfpool.org). 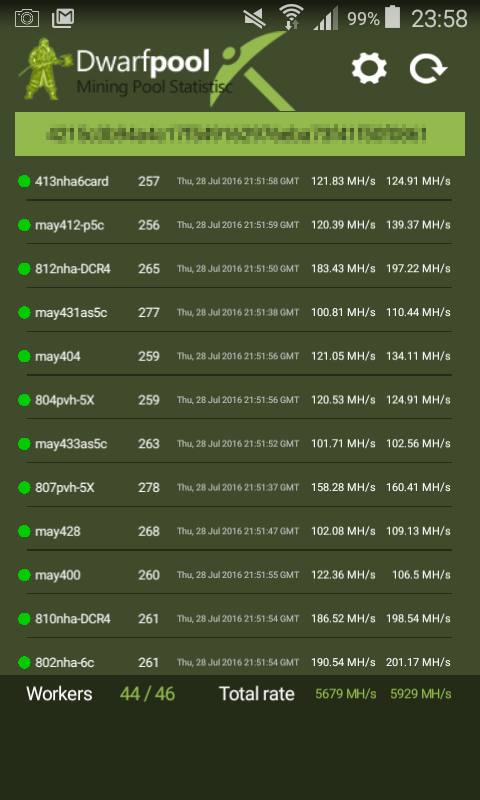 First version is simple view of your miners (standard API). We are working on new functions (shares and payments info). 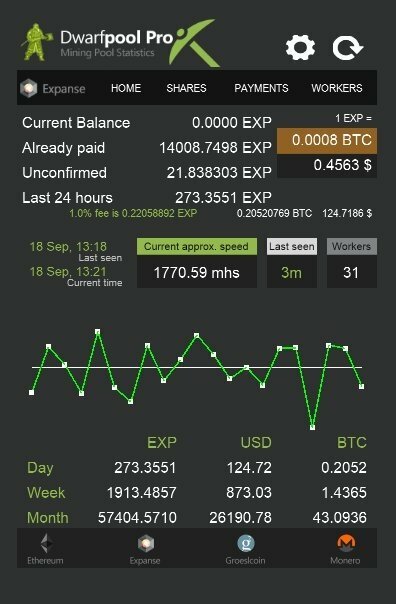 Just now we are supporting Ethereum (ETH), but we are testing this application also for Expanse (EXP), Monero (XMR) and GroestlCoin (GRS). Stay tuned! Comming soon. We have first beta version of Dwarfpool PRO Monitor which supports all currencies (ETH, EXP, GRS and XMR) from Dwarfpool. It's really experimental, no all functions are included, but it works. We support multiple accounts, one wallet per currency. I hope it will be today to download. We need your feedbacks, because it's not simple work like with implementation of official API and we have only few testing data. 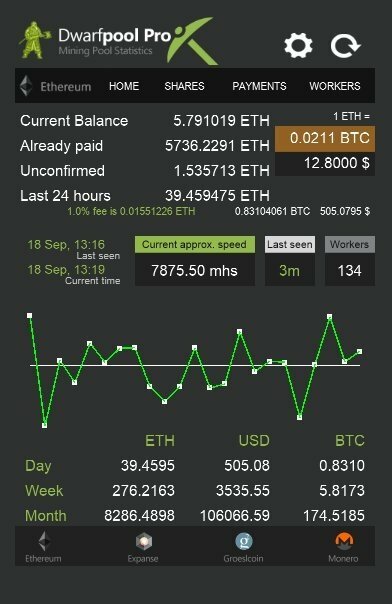 This is experimental BETA version of Dwarfpool Mining Monitor. This version is without any warranty. We are testing new features. Please let us know any problems, errors etc. 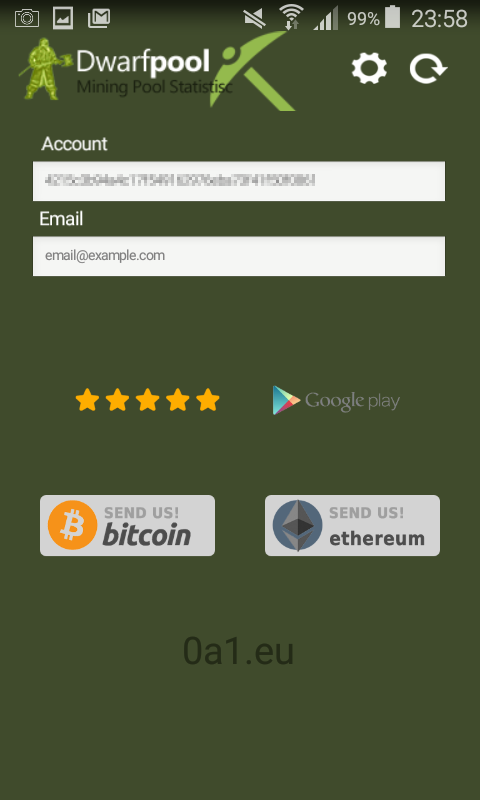 We are testing this app for ETH, EXP, GRS, XMR. Some features are not available yet. We support multiple accounts. It means for every currency one account. You can add all currencies wallets and switch between them. No emails require. If you want stable version with official data, use our other application. It supports only ETH, we are working on EXP. We would greatly appreciate your donation. It's not easy, but we want to keep it free. Please donate to us if you like it. Looks nice. a Few suggestions..1) if you have the lite version installed, have it copy your address from there so you dont have to type in again 2) add the workers stats from the lite version at least.. Thanks a lot. I'm afraid that we can't read datafiles from another app in device. But we will check it. We are working on more functions (workers, payments, shares), but today Dwarfpool is off (website) and we can't test it. btw: information in Lite and Pro version are not similar. I hope you find in Pro version everything you need. Now in testing BETA mode we see big traffic because of our expanded API. I hope we keep PRO version also for free. But maybe I will need some cloud hosting for faster reading data. bug. sorry. try copy address from website stats. it should works. Please update it a test it! 1) Looks good, #'s seem right. 2) I dont understand the graph..i guess the line is the average? 3) Is there any way to show worker shares? 2) Yes thats what i meant..so its the avg of last 24 hrs? 3) yeah, i assume the donate address is in the app? And that's it. But we may find in the future that our API generate big traffic on our servers and we have to close it because of many users or changes on dwarfpool... I'm not sure. That's why we are still testing this BETA version, server requirements, speed and other things. We need about 0.6 BTC/year to keep it free. For donators we are preparing some codes for "no ads" in this app. We'll see how it will evolve.